America, you have Bernie Sanders, who will not win the Democratic nomination, and Rand Paul, who will not win the Republican nomination. In the UK, there’s Jeremy Corbyn, a left-winger and perennial rebel who looks about to ascend to the leadership of the Labour Party and, in doing so, become both leader of Her Majesty’s Most Loyal Opposition and a potential future Prime Minister. There’s a few reasons for that conclusion. Firstly, despite a divisive term in government as part of a Conservative/Liberal Democrat coalition, David Cameron’s Tory party was returned to power this year with a majority and a slim mandate for continuing to pursue an austerity drive. Secondly, Corbyn has had a very long history in Parliament – 30 years of directly going against the party line, coupled with meeting some very unsavory people. His supporters argue that, in the pursuit of peace, he has been willing to meet all sides. His critics say, he hangs out with anti-semites and the stench is on him. The third reason is actually the biggest and most infected with conventional wisdom. In 1983, Michael Foot, Labour’s then leader, a left-wing intellectual who pursued similar policies to Corbyn – a drive to renationalize industries, the scrapping of Britain’s Trident nuclear deterrent, redistributive economic plans – was routed by Margaret Thatcher. The charge thrown at Corbyn – who is alone among the Labour leadership contenders in having addressed huge rallies rather than small, homogenous meetings – is that he is Foot 2.0. The belief is that Labour, driven from Scotland by the Scottish National Party (which styled itself as a left-wing party rather than a simple nationalist movement) and ailing in England and Wales, cannot win by moving to the left. If you don’t begin to be a revolutionist at the age of 20 then at 50, you will be an impossible old fossil. If you are a red revolutionary at the age of twenty, you have some chance of being up to date when you are forty. Another criticism levelled at Corbyn is that he has been intransigent, as if sticking to ones beliefs is not a strength but a sign somehow of mental failing. It’s apparent that the hundreds of thousands of words dedicated to demolishing Corbyn by commentators have been for nought. The ‘Westminster bubble’ – a cliché so loved by Corbyn’s leadership rival Andy Burnham that he should get it tattooed in 20 point Helvetica across his buttocks – has not popped and allowed that message to stray much further than the usual political obsessives. In the Labour Party election, juiced by a right-wing idea to allow people to register as ‘supporters’ for £3 and gain a vote (a plan originally designed to dilute the power of the trade union voting blocks), a movement has come together. The young, the disenfranchised and the angry see something in Corbyn and the internet has played a huge part in that. Corbyn’s speeches are quickly uploaded to YouTube, his policies are promulgated and debated passionately on Twitter and Facebook. He has swiftly become a meme. And memes can be *very* powerful in modern politics. It didn’t save Ed Miliband, of course, whose ‘Milifandom‘ cheerleaders could not make the wonkish target of media mockery suddenly palatable. It looks almost a lock now that Corbyn will win the Labour leadership – some bookies are already paying out even as the contest continues. The trouble is, once he’s in power the press attacks will intensify. No part of his past will be unspun, no comment will go with out misinterpretation. Foot was castigated for wearing the ‘wrong’ kind of coat to a remembrance service at the Cenotaph. His lack of televisual sense and scruffy looks were used to attack him over and over. My former boss at The Daily Telegraph, Damian Thompson, would argue that it was Foot’s policies, too radical a pill for the British populace, wrapped up in a manifesto known as ‘longest suicide note in history’ that did for the politician. He is right, of course, but I don’t believe that Corbyn is a direct analogue for Foot. The ‘anti-politician’, someone who seems plain spoken – even if they are, in fact, using just as many rhetorical devices as a ‘traditional’ politico – is appealing to many in the age of super-polished soundbites and political theater. We are in the age of Anonymous, the pointless internet petition and mass movements born of tweets and Facebook statuses. In a more decentralized world, where campaigning is almost as much about clicks and shares, mind share through social media, not just through door knocking, Corbyn’s prospects are both better and far worse than Foot’s ever were. If he can mobilize a truly large scale political campaign by taking the advice of younger activists who can harness the potential of technology to reach even more potential supporters and to disintermediate an aggressively negative press on both the left and right. On the other hand, it could be death by a million Tumblr cuts, as he says the wrong thing and it is reblogged forever. He could find himself the center of less flattering memes on Facebook and Twitter if he makes gaffe after gaffe in front of the smooth Cameron and his baying Conservative crew. You could say that the ‘memes’ don’t matter but the British press, desperate for material, will leap on them like seagulls spotting a bag of overturned chips. Ed Miliband took damaging knocks on pointless issues like his ability to consume a bacon sandwich, whether he had a second kitchen and the ridiculous decision to carve policy pledges onto a stone tablet. Already, Corbyn is being roasted by the British media for a fairly innocuous comment about women-only train carriages. He was more floating an idea based on discussions he had *with* women. But suddenly, twisted and spun out of all recognition, he is a fundamentalist hoping to impose the burka and make the female population walk 10 meters behind men at all times. When John Major scored a relatively unexpected victory over Labour’s Neil Kinnock in the 1992 election, The Sun newspaper famously went with the headline “It’s The Sun Wot Won It”, beginning a narrative that the Murdoch-owned press can push the buttons of British voters so hard that they switch their votes. It’s that idea that intoxicated Tony Blair and Gordon Brown, the leaders that finally took Labour into power in 1997. They bowed and scraped to Murdoch to get his favour and became obsessed with offering up policies that played to The Sun and the even more draconian characters at The Daily Mail. It might sound needlessly naive to suggest that the situation today is different, but just as Obama was able to transcend the attacks levelled at him from both right and left during the 2008 Presidential election, I actually do believe that Corbyn – a very different, older and more rumpled figure – could outflank his critics. Am I saying he should? Or that I definitely want to see the bearded radical going toe-to-toe with President Trump in some king of wacky world take on that ridiculous scene from ‘Love Actually’ where Prime Minister Hugh Grant tells off President Billy Bob Thornton? No. I’m not. Foot faced a formidable adversary in Margaret Thatcher and he was destroyed by it. 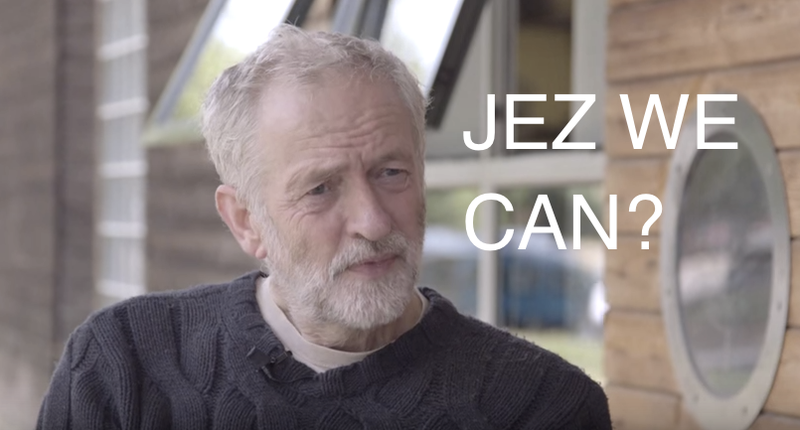 Corbyn is going up against David Cameron, a man of polish with a center that lacks substance. It is not an accident that political cartoonists draw him as a boiled ham or a creature with a condom for a head. His desire for power is transparent, his principles are opaque. What I’m saying is that the political commentariat’s consensus was that Corbyn could get on the Labour leadership ballot but wouldn’t win. Now their singular view is that he will win the leadership election but cannot ever be Prime Minister. What makes them so certain? Hubris, possibly. And I genuinely believe a mass movement can and will emerge from online activity in the UK. The ‘Jez We Can’ push might just be it.